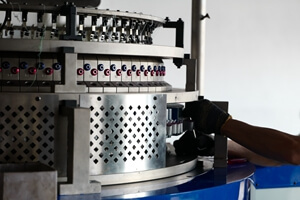 Based on the single knitting machine, the single striper knitting machine adds 4-color or 6-color striper knitting machine parts and a micro-computer control system. Based on the single knitting machine, the single striper knitting machine adds 4-color or 6-color striper knitting machine parts and a micro-computer control system. 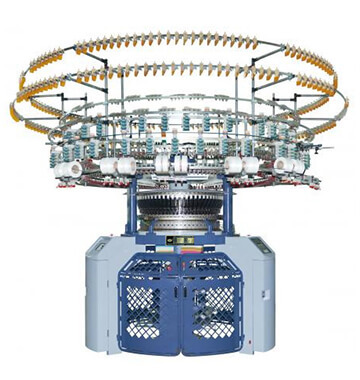 With diverse arrangement of cams and striper system, the machine is able to knit all kinds of high-quality single striped fabrics, such as damask, high-elastic polyester silk or fabrics for swimwear. 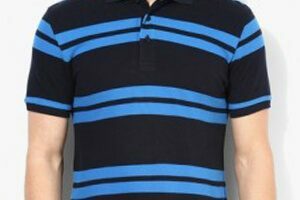 Equipped with optional Lycra attachment, it can knit various patterns with high-quality elastic striper fabrics. Sintelli’s unique striper system has a small, simple construction ensuring a stable coloring system while reducing the possibility of stuck cotton. 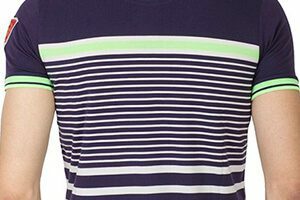 Additionally, by connecting two color selections into one through the yarn finger, the 3-color auto-striper machine can be used as a 6-color auto-striper machine. The 4-color machine can also be used as an 8-color auto-striper machine. This allows increased productivity, giving a faster return on your investment. 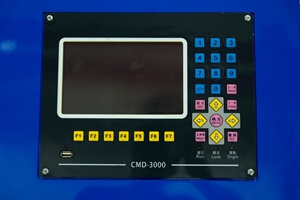 LCD Touch Screen Control System. Pattern information can be input and changed quickly and easily through the LCD keyboard. These data are permanently saved in case of power outages. By connecting via a personal computer, the internal data can be shared to improve work efficiency.